Globalization is now slowly bringing the idea of social drinking to India. Many parts of India still have orthodox thinking. The perspective towards the people who drink is like being drunkards rather than drinkers. This means that the aim among most of the people is to get as drunk as possible. This perspective of drinking alcohol is changing slowly as the awareness about alcohol is increasing between educated people and with the corporate culture of multinational companies. In big developed cities like Bangalore, Mumbai, Pune and so on, drinking socially just to de-stress themselves is becoming a popular habit, especially among the people working in public sectors, IT firms and BPO’s etc. Liquor in India is fairly easy available and most of the brands are also brewed locally. In order to make it cheap and to increase the sales volume, quality is put on stake by adding adulterated products, glycerin and so on. Generally the attitude towards drinking alcohol in India varies in different parts of the country. At some point it feels like it depends on the amount of money one has. For those who have too much, drinking is just a part of civilized lifestyle. For those who have little, drinking often becomes a way to escape from tension and to forget what bad has happened and so on. Now with an increase in the earnings of people, it’s making social drinking more popular in India. The spending power has been gradually increasing and also the corporate landscape has been changing lately. With more and more famous foreign brands available in India, the registered growth in the same had resulted in double digits. The perception about drinking alcohol needs a huge shift. I hope St. ERHARD will act like a catalyst in making this huge change in the mindsets of the people. 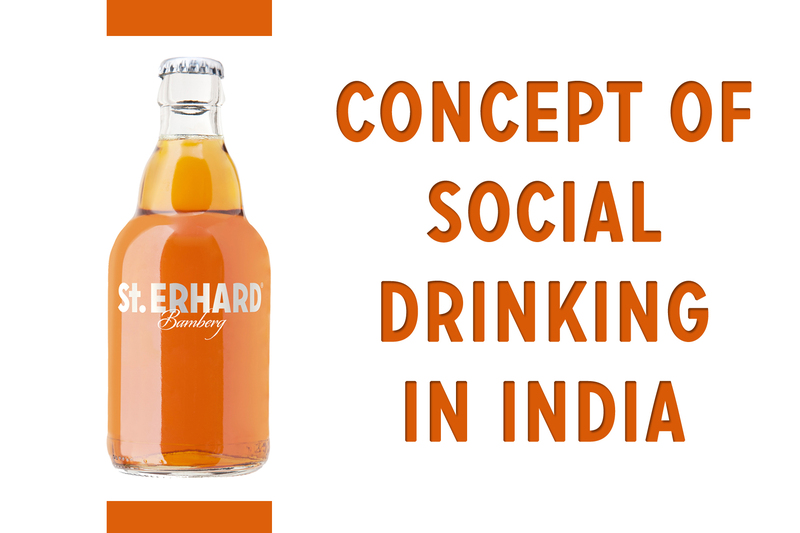 I have already talked about the importance of beer in German culture, also I stated what we at St. ERHARD envision about and the message that we want to portray to all the beer enthusiasts through our brand. We want to be a synonym for German beer abroad. Today through this blog post I would like to highlight the benefits of drinking beer. Yes I am sure some of my fellow natives from India might find it contradictory but yes I have learned the same lately. As in Indian culture we say “Kisi Bhi Cheez ki ati kharaab hoti hai” which means “Too much of anything is bad”. The same goes with beer too, it has to be consumed in the right amount. Beer is said to be one of the oldest written recipes by humans and was written on stone tablets over 5,000 years ago. I found it very astonishing when I read about it. Studies have shown that beer contains all the basic minerals one needs in his/her diet. Also during the European Middle ages when nutrition was very rare, beer was said to be one of the staple included in the diet of the people. Not only adults but also children consumed beer as it was a good source for nutrients and energy. There have been several studies conducted on beer to know about its influence on health. A study which was conducted in The New England Journal found out, those women who drank moderately had better cognitive function compared to non-drinkers. Reasoning behind this hypothesis was that the alcohol raises the level of good cholesterol in the body which results in lowering the risk of heart disease etc. The American Journal of Epidemiology found out that adequate amount beer consumption prevents the occurrence of kidney stones, each bottle consumed per day was estimated to reduce the risk by 40%. Another study published in the American Journal of Clinical Nutrition stated that beer consumption strengthens the bones as it protects bone minerals density because it contains high level of silicon resulting in the deposition of calcium and other minerals into the bone tissues. Furthermore, brewer’s yeast also contains significant amount of magnesium, selenium, potassium, B vitamins and so on. Usually it’s believed that over consumption of beer leads to a beer belly, but a recent study has found answers to this belief. It has been reported that in most of the cases of over consumption, the reason has been the lack of proper exercise and increase in the volume of carbohydrates and so on. 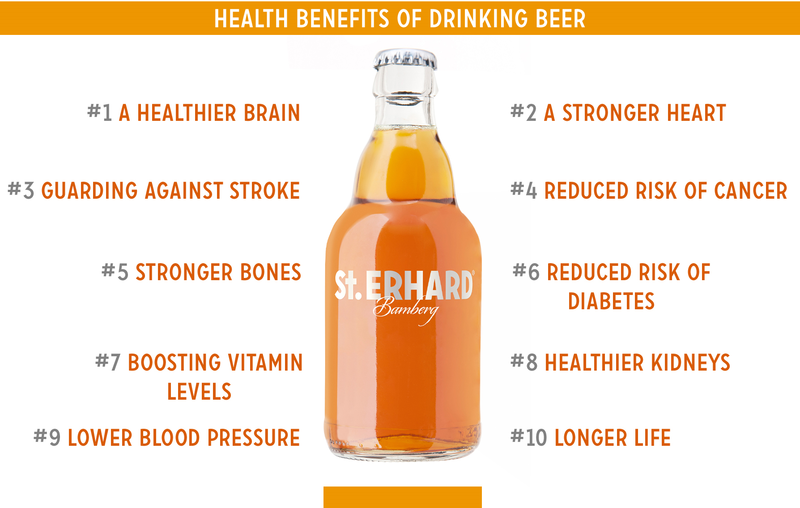 St. ERHARD is not only promoting the German beer culture but also promoting the act of moderate consumption of beer throughout the globe. We believe beer has developed as a culture and it has to be cultivated and be preserved responsibly. It goes without saying that we abide by all the national laws regarding the local drinking age and do not market or target our product towards an adolescent audience.